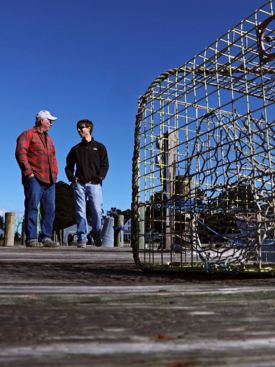 Partnership VIMS graduate student Jim DelBene (L) and his professional mentor J.C. Hudgins look over the water along a dock on Gwynn's Island in the Chesapeake Bay. © A. Devlin | Virginia Sea Grant. Blue Crabs Chesapeake blue crabs bust out of a bushel basket after a day's catch off Gwynn's Island. © A. Devlin | Virginia Sea Grant. 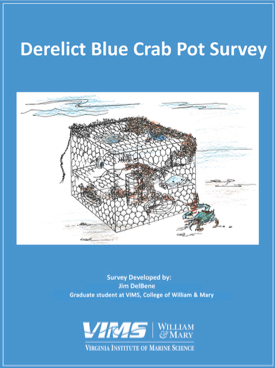 Researchers at the Virginia Institute of Marine Science are using a mail survey to ask local crabbers to share their opinions and experiences related to commercial hard crabbing and derelict, or “ghost,” crab pots. 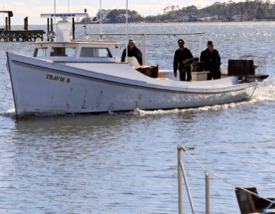 The results will identify crabber preferences for hypothetical activities and incentives that could help reduce the number of derelict pots and their impacts in Virginia’s waters. DelBene hopes that his survey can provide commercial hard crabbers with a way to share their thoughts with the public, scientists, resource managers, and policymakers. He has already teamed up with two focus groups of four to five watermen—one group in Hampton Roads and one on Virginia’s Eastern Shore—and met with state resource managers at the Virginia Marine Resources Commission (VMRC) to tailor the survey’s questions and wording for its intended audience. Hudgins says the survey will provide an important sounding board for local watermen, many of whom downplay the magnitude of the derelict-pot issue. They cite among other considerations the sharp drop in the number of hard crabbers in Virginia during the past few decades—from just short of 2,000 in 1999 to just over 1,000 today—with an attendant drop in the number of crab pots deployed and potentially lost. 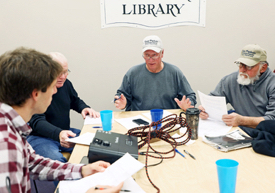 Those activities run the gamut—from providing on-land recycling facilities for old pots to educating recreational boaters on how to avoid severing the line that ties a submerged pot to its visible surface buoy. Other possible activities include a targeted derelict pot removal program—like the one managed in Virginia by VIMS and VMRC from 2008-2012—or a requirement to put an identification tag on each pot (not just on the pot’s buoy as is now the case). In the survey, DelBene will use a method called “discrete choice experiments” to identify the watermen’s preferences and evaluate tradeoffs among different options. The surveys will present hypothetical options that pair activities—like educating recreational boaters or removing derelict pots—with incentives such as an increase in the pot limit or an extension of the crabbing season, along with potential cash payments. The survey will also gather data on crabbing activity, such as the number of pots fished and lost, and personal characteristics, including commercial crabbing experience and motivations. Ghost pot program a "win-win"